Earn 5.4 SB per $ when you buy Shutterfly gift cards at MyGiftCardsPlus, powered by Swagbucks. 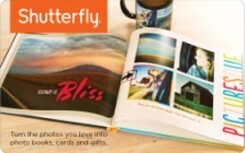 • Gift Card can be applied toward any purchase (including shipping charges and applicable sales tax) made at www.shutterfly.com. • This gift card cannot be applied toward the purchase of products picked up at Target. • To redeem, you must be or become a Shutterfly member. • Any unused balance will be stored for future purchases.